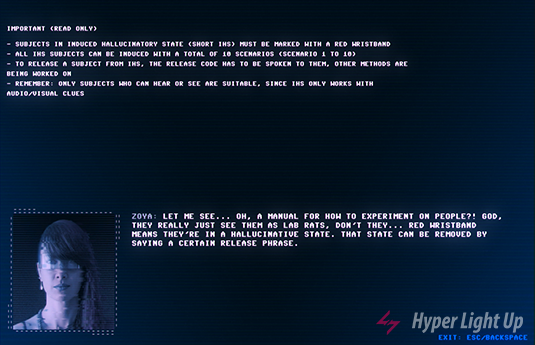 Almost a year ago we reviewed the wonderful hacking/next gen text adventure Code 7 Episode 0 : Allocation by Goodwolf Studio. The game was given free to everyone by the developers in order to help with their Kickstarter campaign. Gamers had the chance to first try the game and then decide if they want to support, which was an excellent move by the studio. And it really paid off, since the Kickstarter campaign was successful and now we have in our hands the first episode of the series, Episode 1 : Threading. Since this is a story heavy game, this review might contain some spoilers from the previous episode. I would suggest to go visit the Steam page of Code 7, download Episode 0 and experience it for yourselves before coming back to the review. It is free so you have no reason not to do that. Episode 1 continues after the events of the first episode with our heroes Sam and Alex to have escaped Schroedinger station. On their way to Earth they decide to compile an antivirus for Code 7 using the ship’s power, since the antivirus needs to be deployed before contamination. That ends up being a bad idea, the ship starts overheating, messing up the flight controls and is heading straight to Mars. Sam decides to send Alex over the satellite network in order to warn everyone at Oriens station for the imminent crash. It is at Oriens station that the story of Episode 1 takes part this time. As it happens, you manage to connect yourself to Zoya Illyushin’s computer and she will be your partner for the rest of the episode. You will have to get the attention of the residents there in order to warn them about the crash and also help you send a signal to Earth about Code 7. Episode 1 : Threading plays like the previous episode with the interface being an updated version of an MS-DOS system. You control Alex and you have the ability to jump to any computer in the network, hack them and learn information that will help you proceed. 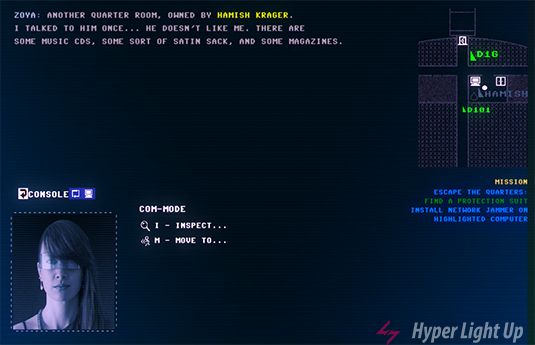 The game has a more investigative tone this time around, as you will need to find personal information about the characters you meet in order to hack their computers and advance the story. The screen is separated between three parts. Top left you can see all the dialogue and type the commands. The bottom part shows the dialogue choices and the console options of the network that you can search. 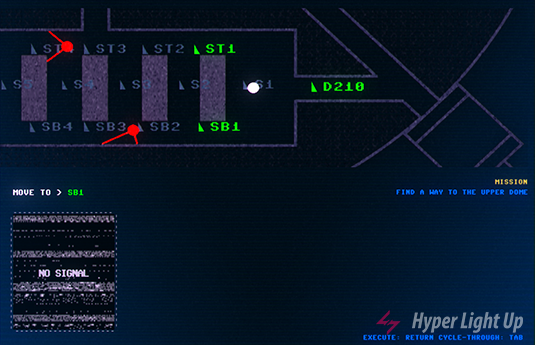 Finally, at the right part of the screen you can see a schematic of the area that you are, available nods that you can connect to, characters as blue dots and lasers that you will need to disable. 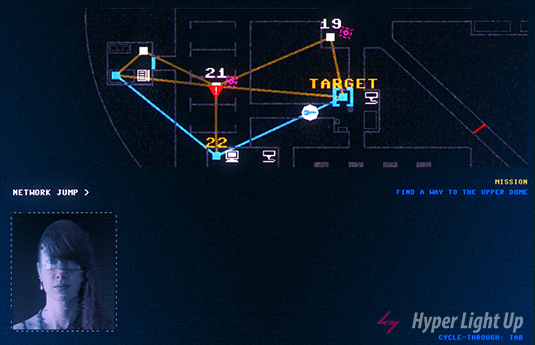 As the game is mostly text based, this schematic view helps to convey the action and helps with the immersion. You will change between two modes while playing, the console and the com – mode. The former is mostly described at the previous paragraph, as far as the latter goes, it’s the one that you give orders to Zoya to move around the station. You can also have her inspect items or tell her information that you have learned. 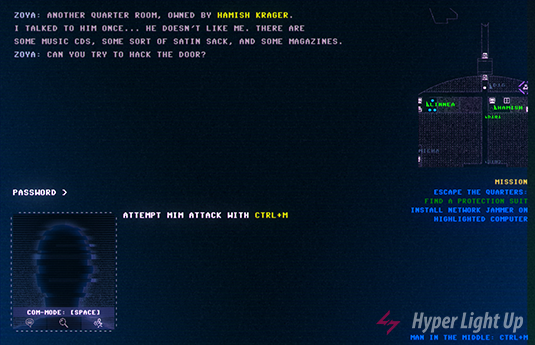 At some points in the game you will need to hack your way into a computer, a printer or an airlock by performing a Man In the Middle attack. Everything that is connected to the network will be represented as nodes that you will need to activate. When you do that, the signal will start to move from the origin source to the destination and you will have to place a key somewhere in between, so it will be carried to the final destination with the signal. Most of the times there will be a drone that will try to intercept your key and prevent you from connecting to where you need to. At this point the network jammer, a new addition to your arsenal, comes into play. Since the moment you acquire the tool, you have the option to install it in anything that is connected to the network, be it a computer, a scanner etc. When you perform the MIM attack, those infected nodes will have the ability to delay the drone and help the signal go through. Sometimes one of the computers that you need to access will need a login password. The investigation you do throughout the game helps at these moments. You can use brute force to search among the relevant information you found about the owner of the computer and try to guess the password. If you can’t find it, that means you will need to go back and search places that you haven’t before. That helps because through this way you will learn more about the station, its residents and its dark secrets. Code 7 is a minimalistic game as far as visual style goes and that’s why in the game there is full voice over. The work that has been done by the actors is once again incredible. The actress that plays Zoya does a great job in conveying the feelings of each moment and some of the actors have different accents which helps which believability, since Oriens is an international station. Soon I forgot I was playing a text adventure and I thought I was watching a theatrical drama. The whole audio design is carefully and wonderfully mixed. The quality of the dialogue audio changes depending on where you hear it. For example it is different the moments you hear through a microphone, through an EVA suit or through the headlens. What took me by surprise was a moment where Zoya throws her headlens on the ground and the audio design immediately changes, you can hear her voice coming from the top right part of the audio spectrum and in the distance. I thought I was really lying on the ground and listened to her. Audio is hugely important in any game and the guys at Goodwolf Studio did a great job at this respect. The music is also fitting to the setting, mostly ambient with cyberpunk elements reminiscent of the work Vangelis did on Blade Runner, without the heavy synths. The musical tracks follow the beats of the story and enhance the feelings of every situation you will be in. Another surprise was the song that plays at the intro sequence of Episode 1 that I felt it could well be an intro sequence from a James Bond film. I really enjoyed Episode 0 and I am happy to report that Episode 1 is equally amazing. The story continues and opens up in scale, now we are in a space station with more people and the stakes are higher. I enjoy that progression between the two episodes because it feels natural and not rushed. Since I saw the ending, I feel it will continue this way with the next episode. I wrote before that if an adventure game has great story and characters, I don’t mind the quality of the puzzles. In Code 7 Episode 1 the puzzles are not hard, you will mostly do investigative work and solve the MIM minigame, which won’t take a lot of your time. Only the final puzzle of the episode is challenging but thankfully not frustrating. Even though not hard, the puzzles that are in the game help to push the story forward, I really felt they were part of the world and not something that was added hastily. During my playthrough I found a dialogue event that repeats while revisiting the area the characters are and an audio log that seems to be missing from the game. These two bugs in no way break the game, they just took me a bit out of the immersion and the developers are already working to fix them. Finally, at some MIM attacks I have some heavy frame drops and I can’t understand the reason for this to happen. These problems still weren’t enough to change my opinion about an otherwise fluid experience. You can buy Code 7 on Steam. At the moment it is on 10% sale and it costs 15,29€. Goodwolf Studio love what they do and that can be seen in Episode 1 : Threading. They pay attention to the world building, expanding their universe slowly but steadily, using talented actors to perform their lines beautifully and give life to their creation. This is a quality release that will surprise lovers of interactive stories and adventurers alike. I hope these guys finish the next episode sooner than expected.